Welcome to the newly re-tooled Web Showcase, which will now be referred to as 'Web Showcase,' but hosted by myself, Danielle (see little change). This month we'll be taking a look at an interesting little site dedicated to the current Rumiko Takahashi hit, Inu-Yasha. Chiisana Inuyasha introduces those who don't know of the show formally, to a spoiler free synopsis of the show, and to the legend that the show is based upon. All the information is written by the webmaster and is informal but informative to anyone interested in the legend behind the show. Moving on, she gives information about the run of the manga and anime series, where the two mediums can be obtained, and the voice actors of the anime series. The webmaster isn't too hung up on details, but she gives us enough to have an idea of how to hunt for the show. She also gives a small page to the movies, of which she adores. In another section, she gives us a small bio for the main cast and the supporting class, while not forgetting the villians. Along with these biographies is a nifty hiragana and kanji page which explains what each characters name means. Chiisana Inuyasha not only gives out information on the show, the manga and the characters within the show, but gives the fans some fun sections to play around in. 'Ask Inuyasha' is a page where the fans can send in questions to one of the characters 'Miroku' and receive a humourous response. Currently, the submissions are closed, but one can read the cute and often, innane questions that were asked of this poor 'Miroku'. Not one to leave the artsy fans hurting, this site includes a well-developed fanfiction pages, all stories of which written by the webmaster herself. Rounding out the fan section, is a page with Inu Yasha cosplay tips and ideas and a gallery for submissions of fanart. This site gives us a great mix of information and fandom for the show and manga series, but one of the most surprising sections that I found was the 'Attacks' section. It contained all weapons and attacks used in the manga series up to the 17th volume. It was well developed but I didn't expect to see it on a page with a pink background. Guess she showed me! 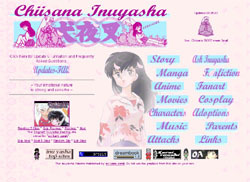 Chiisana Inuyasha gives enough information on the series to inform a new or early fan, and gives enough fan incentive with stories and art for the knowledgeable fans to continue to visit the site.With frequent updates, this well maintained site has almost no problems (with exception to the occasional broken image) and leads you to other exceptional Inu-Yasha on the internet.